Carpet stretching is a common repair in most homes that range between 3 to 7 years after the carpet is installed. The carpet shows signs of being loose and ripples form in certain areas. The need for carpet stretching is very common because carpet installers do not put enough tension on the carpet during installation. During installation, if the carpet is cut to fit a room and knee kicked into place then over time, with wear and humidity, the ripples appear and the carpet needs stretching. Power stretching puts tension on the carpet by using an arm and pushing off the adjacent wall while stretching it into place on the adjacent tack strip. The excess carpet is removed and discarded. We can make your carpet look new again through proper carpet stretching techniques. With our trained professionals and power stretching equipment; we can fix those ripples with putting proper tension on the carpet and removing the excess. 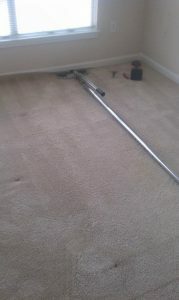 After stretching the carpet we can offer carpet cleaning services as well. Most furniture can remain on the carpet while the stretching procedures are taking place. However, some pieces will need to be moved. Our trained technicians have proper furniture moving tools with them to assure it is done the correct way. Custom pool tables may require professional to remove them for stretching procedures. Once you have carpet installed or re-stretched from a professional company, go to the center of the room and with 2 fingers pick up on a fiber bringing the carpet up off from the floor. Let Go! If the carpet bounces and snaps back into place, then the carpet has good tension and you won’t be bothered with ripples in the future. If the carpet falls slowly back into place, question the tension on the carpet. Contact us today 770-339-9340 for more information about our carpet stretching repair service.